OSCAR Pistorius told a concerned security guard on the phone that everything was “fine’’ after neighbors reported gunshots coming from the athlete’s house the night he shot dead his girlfriend, according to new testimony in the South African murder trial. 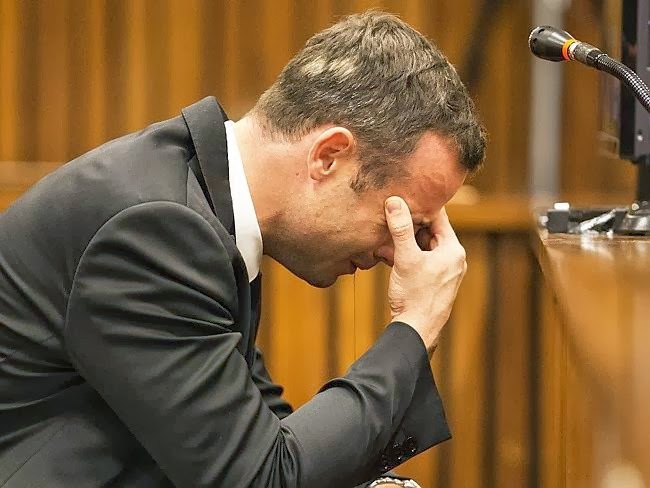 The security guard, Pieter Baba, testified that Pistorius phoned him back soon after the initial brief conversation, but then started crying, didn’t say anything and the line went dead. It was minutes after the double-amputee Olympian fatally shot Reeva Steenkamp, for which Pistorius is now on trial for murder. “Not everything was in order as Mr. Pistorius was telling me,’’ MrBaba recalled saying to a fellow guard as they were outside the runner’s villa in the pre-dawn hours of Valentine’s Day last year. Mr Baba’s testimony followed a damaging description of Pistorius’ character by an ex-girlfriend. Samantha Taylor, who cried twice during her time on the stand in the Pretoria court, said that Pistorius always carried a firearm when they dated, sometimes shouted angrily at her and her friends, once shot his gun out the sunroof of a car, and that their relationship ended when he cheated on her with Steenkamp. There were murmurs in court when Ms Taylor said their relationship ended when he cheated on her with Steenkamp. Ms Taylor said she started going out with Pistorius in 2011 when she was 17 and the relationship ended in November 2012. Ms Taylor described some of Pistorius’ habits while they were dating, including what side of the bed he slept on at home and where he kept his gun during the night. Ms Taylor’s observations of what Pistorius did when they were together show different habits from what he says he did when he shot Steenkamp with his licensed 9 mm pistol. Pistorius, 27, is charged with premeditated murder for killing Steenkamp, a 29-year-old model. Prosecutors charge he did it during an argument but he insists it was a mistake, and that he fired through the locked toilet door in his bathroom believing an intruder was behind it.